La Bayadère is the story of Nikiya, a temple dancer, and Solor, a warrior. They have sworn to be true to each other, but fate, as it so often does, especially in ballet, has other ideas: the high Brahmin at Nikiya’s temple is in love with her and wants to do away with his rival. A nearby Rajah has decided that Solor should marry his daughter, Gamzatti. The high Brahmin informs the Rajah of the young warrior’s love for the temple dancer. Bad things happen, and Nikiya ends up being bitten by a snake after she dances at her beloved’s engagement party to this other woman. Rather than taking the Brahmin’s antidote and living without Solor, she chooses death. Confused? Don’t worry about it. The third act has almost nothing to do with the first two: Solor, horrified, dreams of her that night and follows her into the “Kingdom of Shadows,” a mostly decontextualized third act that is far more about choreography and the beauty of dance than it is about the story. This third act is often presented on its own, without the rest of the ballet. So, those are the positives. I could happily watch that third act without any of the stuff that comes before it. Because, oh, the problems with this ballet. Where to begin with La Bayadère? One of Marius Petipa’s many ballets, it is said that he and composer Minkus were inspired when real Indian “temple dancers” toured Russia. Petipa is the choreographer and ballet master behind Spanish-flavoured ballets Paquita and Don Quixote, Byron-inspired Le Corsaire, and such iconic works as The Nutcracker, Giselle, Cinderella, The Sleeping Beauty, and the most famous version of Swan Lake. As was the fashion throughout many cultures in the 1800s, Petipa latched onto the “Exotic Other,” creating ballets that were about mythical or faraway places and times, about settings and people exotic and different from his own. In the case of La Bayadère, Petipa set his ballet in “ancient India.” It does not appear that he did research beyond possessing a vague knowledge that India has temples, rajahs, and harem pants. The story is not derived from any Indian source. The names are not Indian. The religion depicted is. . . honestly, I don’t know what it is. There’s a temple in the background that houses a random golden statue (a bit like a Buddha with a topknot) and there is a sacred flame attended by, well, cavemen, as near as I could tell? The temple is run by the High Brahmin, who you can tell is in charge because of his big red robe and fez (yes, his fez). Brahmin and…caveman? Andrei Sitnikov and Anton Savichev . Photo © Marc Haegeman 2007. The scenes scream of orientalism, an essentializing, stereotypical, often patronizing and generally false depiction of Asian culture by Western, or “occidental” cultures, often with an emphasis on mysticism: this a story set in a dark and distant land full of strange people who are unlike us in custom and dress, purely for the purpose of spectacle. Several of the dancers portraying monks are in saffron robes and are wearing skullcaps to appear bald, seeming to be Tibetan Buddhist transplants in this ancient Indian jungle. You can see the full-body black spandex here, though the painted faces are turned away from the audience, watching the “Bronze Idol” dance–which is a troubling character in his own right. So, we have an all-white cast performing a ballet over a century old that is based on this one time some Indian dancers came through Russia. Is it fair to criticize Bayadère when other ballets cut broad strokes against other cultures? Giselle, for example, might not showcase an accurate portrayal of the Rhineland in the Middle Ages; Don Quixote might be a bit liberal with its Barcelona setting, but it, at least, is based on the Cervantes novel. As well, Don Quixote nods toward Spanish music and dance. 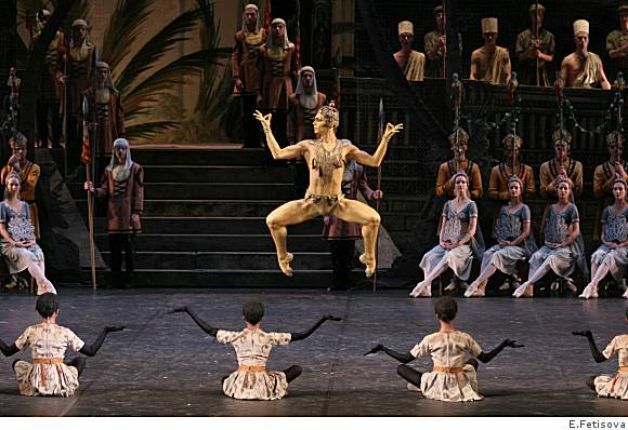 Sure, in Bayadère there are the aforementioned harem pants and the dancers occasionally raise their hands intertwined above their heads—based perhaps on what Petipa saw the visiting temple dancers do. But that’s it. Just as insidious as the overtly racist imagery, if perhaps a bit subtler: nothing here evokes India whatsoever apart from these very few flourishes. Sure, the sets show a temple in a jungle, but the story of the common woman whose noble lover is to marry a noblewoman instead of her, and who therefore kills herself/chooses death, and spends the final act as a ghost is just Giselle with elephants. And, in this case, cavemen. The story isn’t Indian, the names aren’t Indian (Gamzatti? Nikiya? ), and the costumes are passingly Indian only in a “we saw some Indians wearing something like this, sort of. Maybe. Also, we added in a bunch of tutus” way. Minkus’ score is musique dansante style, which is to say it’s polkas and waltzes and sounds like every other ultra-Euro-Russian score of the time. Not a step of Petipa’s choreography strays outside classical ballet repertoire. This story might as well be set in a made-up land for all it has to do with anything on this earth, and in 2013, how can that be okay when it is, in fact, meant to be set in India? The cultural appropriation and racism is shocking. La Bayadère reminds me of being a young dancer when we were choosing what our competition pieces would be for a given year (“This year we’re hippies! That means we’ll wear bellbottoms and our hair down and swing our arms like this!” “This year we’re Can-Can dancers! Yips and high-kicks and big skirts!”), putting on the costumes and settings of other time periods or cultures. Even so, our music and choreography always reflected and were influenced by the choice of dance setting. Petipa’s Bayadère has none of that, however. This kind of cultural stereotyping was commonplace in the 1800s and much of the 1900s. Just look at Bugs Bunny in blackface in now-banned 1950s cartoons. 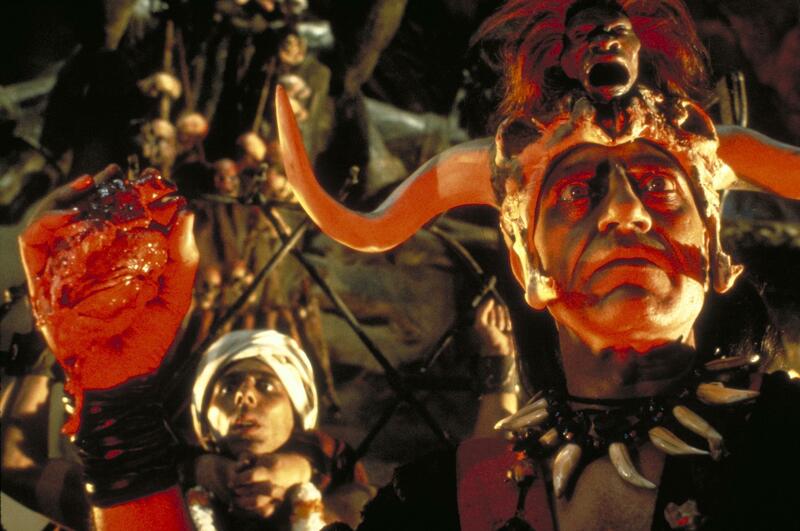 Or consider Indiana Jones and the Temple of Doom from 1984. Its depiction of the bloodthirsty high priest of the human-sacrificing Kali cult (who is somehow capable of thrusting his hand into a man’s chest, pulling out his still-beating heart, and throwing the man, still living, into lava) isn’t so different from Bayadère‘s interpretation of Hinduism. It’s meant to evoke shock and exoticism. It isn’t in any way an accurate portrayal of real people. Certainly we have to be careful in saying that an all-white cast can’t use dance to tell a story set in another geographical and cultural space. 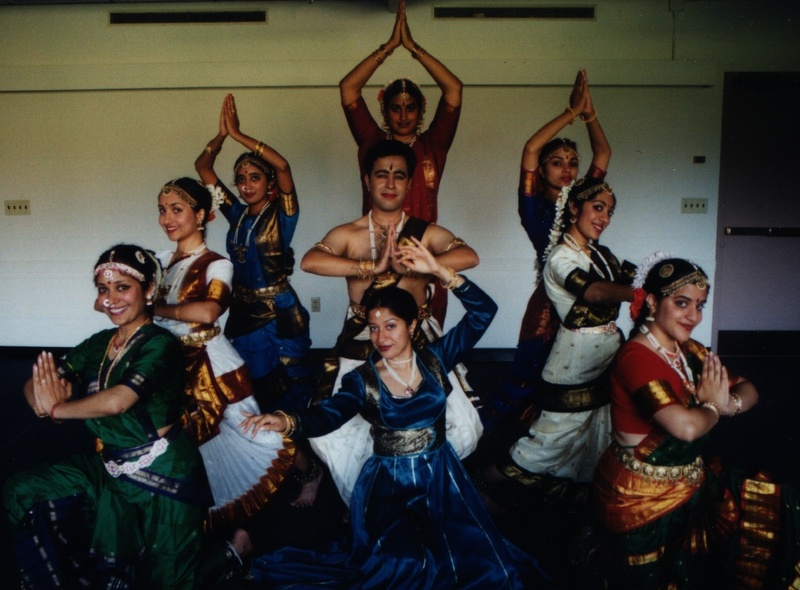 The flipside of that argument might be, for example, that an Indian dance troupe can’t perform Romeo & Juliet because they aren’t white and British (or Italian, come to that). This kind of essentializing is dangerous. Dance can and should transcend cultural boundaries. But it needs to do so in a thoughtful and sensitive manner, borrowing and celebrating rather than appropriating and misrepresenting culture. In 2008, Manitoba’s Rainbow Stage mounted a version of J.M. Barrie’s Peter Pan, another stickily racist Victorian tale, a play that usually portrays Aboriginal peoples as “red Indians” whooping and war-calling all over the stage. The theatre company rethought and restaged these scenes with a traditional First Nations hoop dancer and culturally accurate and sensitive costumes and actors, creating a stunning setpiece and bringing new life and depth to the play. Should La Bayadère be struck from the ballet pantheon? Not necessarily. I’d love to see the story made new with actual Indian dance choreography worked into the ballet, with a bit more attention paid to where and when the story is set and how it might actually operate in the culture in which it is supposed to take place. In the meantime, I don’t recommend seeing the traditional version of La Bayadère. This is indeed an amazing and connected world we live in, and one where a greater understanding of our fellow human beings—not strange Other people—is a necessity. With so many other classical ballets in their repertoires, companies can do better than this terribly stereotypical, orientalist old clunker. It’s time to update the temple dancer or put her out to pasture for good. Oh my. I don’t really know what else I can say. Err… I’m glad I didn’t come with you to see this performance? Not that it makes you feel better! It’s funny that you mention First Nations hoop dancers. I was just thinking back to last summer when I went hiking in Crawford Lake conservation area. On its grounds is a pre-contact archeological site, which led to the construction of a replica 15th century Iroquoian village – all very cool stuff (longhouses are awesome… plus it’s a lovely hiking destination). Anyway there was this special event on while I was there, and I saw traditional First Nations dancers in full regalia. But from a distance, one of the dancers looked caucasian. I suspect he was 1/4 or 1/8 aboriginal, not that I really care: he danced well, and I didn’t look at him and think “white guy”… I thought “skilled dancer”. Both 100% genetically aboriginal and 100% genetically non-aboriginal people (and everyone in between) should be able to perform traditional dance, provided they were taught well and respect the culture. Which brings me to my point: it really ought not to matter what ballet dancers’ colour of skin is. Yes, let’s see an East Indian woman as Juliet. Is her dress similar to what one would have seen in Italy in the middle ages? Do her movements, gestures, and facial expressions show love and heartache? Does she dance well? That ought to be more than sufficient, no? I really enjoyed reading your thoughts about this production. I recently read “Imperial Dancer: Mathilde Kschessinska” by Coryne Hall. It was an interesting read about the ballet world in Russia when Petipa was active. Thanks to your post I’ll be checking out Cineplex for upcoming presentations – I didn’t know that they did this kind of thing – great!